Pergolas are another eye-catching structure for any backyard, and are very versatile as to where they can be put, and what purpose they serve. They may link or extend from a building's door to an open garden feature such as an isolated terrace or pool. Freestanding pergolas, those not attached to a home or structure, provide a sitting area that allows for breeze and light sun, but offers protection from the harsh glare of direct sunlight. Pergolas also give climbing plants a structure to grow on. 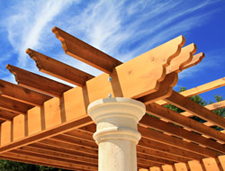 At Sundeck Supply Inc., we provide outstanding vinyl pergolas made by Superior Plastic, in white, ivory, or clay shades. Sundeck Supply, Inc. carries the top manufacturing brands of Pergolas, and makes them easily accessible to the areas in and around Laurel, Fulton, Highland, Columbia, Silver Spring, Clarksville and Ellicott City, MD. Our full product line is also available via delivery to VA, DC, WV, DE, and PA.